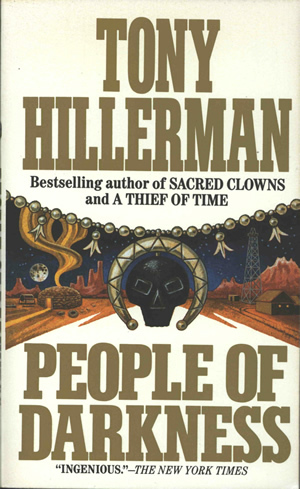 The fourth novel in Tony Hillerman's Navajo Detective series. People of Darkness introduces Sergeant Jim Chee of the Navajo Tribal Police, a younger and in some ways more traditional Navajo than Joe Leaphorn. This edition was published by HarperCollinsPublishers in 1991 in New York. It is part of the HarperPaperback series, which reprints popular novels in a cheaper paperback editions.The cover art was created by Peter Thorpe. This novel re-introduces Albuquerque, specifically the University of New Mexico central campus, as a setting. Although Hillerman began his first Navajo detective novel, The Blessing Way (1971), on the UNM campus, the setting quickly shifted to the Four Corners area. In People of Darkness, the action is split almost equally between the UNM Medical Center and the slopes of Mount Taylor, near Grants, NM. People of Darkness also treats the topic of Navajo witches, or skinwalkers, first introduced in The Blessing Way, again exploring the darker sides of humanity when someone chooses to reject walking in beauty, or hózhǫ́, disrupting one's harmony with the universe in order to satiate personal greed.